THE RUSSIANS CAME AGAIN - AND CONQUERED! 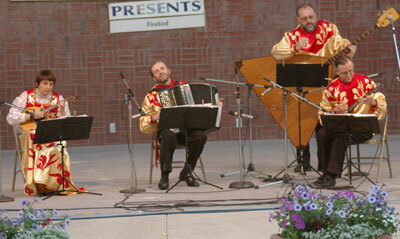 On Mother’s Day weekend, The Firebird Balalaika Quartet performed twice in Hemet, to the complete delight of both audiences. The first concert on Saturday, May 12, 2007, was for the free concert series Music @ The Library, with a second appearance on Sunday, May 13 for the Hemet Community Concert Association. This was a return by request for the group, who played a well-remembered concert for HCCA in 2002. The balalaika is a triangular 4-stringed instrument rather like the mandolin. For most Americans, their introduction to this quintessential Russian folk instrument was the film Dr. Zhivago; hence “Lara’s Theme” is an obligatory number on such programs. Speaking as one who has heard this tune countless times, and really didn’t care to hear it again, I was most pleasantly surprised by the beautifully arranged Firebird version. Fans of the film could relive every emotion, but it was superb in its own right – I actually enjoyed hearing it! The musical and artistic directors, Iryna Orlova and Anatoly Mamalyga, are virtuoso performers – she on the domra, a round version of the balalaika, and he on the bayan, a kind of accordion. They included several duos on the program – most effective were “The Peddlers” and a gypsy tune by Monti. To make the quartet, they were joined by Peter Rothe and Tom Barnes. Their playing was without exception musical and entertaining, from the most melancholy café song to the liveliest folk dances. Mamalyga is also responsible for most of the arrangements in the program, which were first-rate. Throughout the concert, the audiences enjoyed the clever remarks of Rothe, who served as emcee; and the visual aspect of the concert was enhanced by the traditional costumes worn by all participants. After a very generous program, the audiences clamored for more – and had to be sent away wanting more, as the Firebird had given all they had! There are a couple of other Russian folk groups making the rounds these days, and I can tell you honestly that the Firebird is musically superior, with authentic performance technique and a varied, entertaining program. They are professionals, who can do a great concert in any venue, as this weekend proved. The audience in the library conference room with no sound system or stage lighting enjoyed themselves just as much as the audience in the fine hall with full technical support – because the music was simply wonderful, regardless. Your audience will love them!